China is a huge smartphone market and growing at quite a rapid clip, but more amazing than the size of the market in China is the relative lack of mobile platform competition in the region. New data from Strategy Analytics says that 86% of smartphone shipments in Q4 2012 were Android devices, and a mere 12% were iOS. And just in case you don't want to bother with the math, that means only 2% of all smartphone shipments in Q4 in China were not either Android or iOS. To be fair though, because this is China, a large number of the Android devices are non-Google Androids (NGAs), meaning that they don't come with Google Apps (Gmail, Maps, Calendar, Talk, etc) or the Google Play Store. Because they are Android forks, they share the same open source bottom layer that you'd find on any Android device, but instead of a Google top layer, users get a forked experience like you'd find on Amazon's Kindle Fire, or Barnes & Noble's Nook. Depending on how you like to count Android installs that may mean something, or it may not. We're a bit torn on the subject, because Google's layer does add quite a lot to Android, but even without Google, Android has quite a lot to offer. Overall, mainland China saw smartphone shipments grow 64% year-over-year to reach 53 million units in Q4. Given the overwhelmingly large chunk of that taken up by Android and iOS, it doesn't give a lot of hope to competing platforms like BlackBerry, Windows Phone, or Sailfish, which Jolla specifically said would be targeted to China. Hmmm, I wonder if APPLE would create a specially made, and cheap version of the iphone, just for CHINA? It could be worth it. say 256MB RAM, 3.0" screen with 123 pixel density, somewhat a fat phone with breakable glass and 4GB of storage. i visited China recently, most people i run into use an Android smartphone with a screen size of 4.3" and above. Their phone have local chinese branding not heard outside China. Google open source effect on full swing there. Most phone don't have Google apps but were able to run Android Apps side loaded i think.. LOL!! Agreed, especially when I can download apps from the Amazon App Store on my N4 & N7. So how much is WINDOWS? 1%? I don't think you'll see forked versions of iOS. 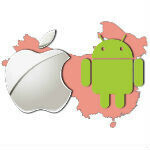 China is android land.